Traditional bikes, road bikes and mountain bikes have long been a great way to get around Vermont, but recent innovations in Cargo and Electric Assist bikes are adding a whole new dimension to how we roll. Cargo bikes feature increased carrying capacity that’s ideal for a range of needs. Electric Assist bikes make it possible to climb even the steepest of Vermont hills. E-Cargo bikes combine e-assist technology with a cargo bike. These workhorses are up for the challenge, whether you’re towing the family, commuting to work or loading up at the grocery store. Listen to Dave Cohen, founder and director of VBike, explain what Cargobikes can do for travelers on VPR. Watch this documentary clip by Liz Canning on the American Cargo Bike revolution. Cargo bikes come in a variety of shapes and sizes, with numerous load-carrying options, depending on your needs. With extra features such as kid’s seats, rear handlebars, panniers, sidecar trailers and front baskets, almost any errand is possible with a Cargo bike. An extra-long wheel base makes them incredibly stable and easy to ride. Extra length = more cargo space. With loads of child-carrying options – from seating for toddlers to older kids, and front basket add-ons for lunch bags, books or other gear – these bikes are popular with parents. Additional cargo is secured easily thanks to the extra long rear deck. Add in the electric-assist option to handle our hilly Vermont terrain with ease. With racks, baskets and trailer options to handle a good size haul. A great way to get around our sometimes bumpy roads. A standard wheelbase with a stronger frame and shorter deck. Lighter and more nimble than larger cargo bikes. Features an incredibly long wheel base and a low-to-the-ground cargo area. For heavy loads or multiple passengers, the low cargo area adds tremendous stability. They can be outfitted with electric-assist and a weatherproof covering, so you can climb the hills with your kids on board, keeping them warm and dry during any Vermont season. Feature an integrated compact electric motor and battery, to propel your bike when you need it – like on those rolling Vermont hills. The human-power element sets this apart from an electric motorcycle, so you can power your bike by pedaling alone, or with battery power. Add-on kits can turn your favorite bike into an e-bike. Learn more at electricbikereport.com. Below is a list of some retail options for Cargo and E-Assist bikes, by town. Remember to check with your local bike store first, to see what options they can provide. ROAD — Designed to travel quickly on paved roads. CITY — Designed to handle rough urban road hazards (like potholes, grates and curbs). MOUNTAIN — An all-terrain bike for off-road or unpaved cycling. HYBRID — A design that blends the comfort and speed of a road bicycle, with the stability of a mountain bike. Before selecting a bike style, consider your daily commute needs. Not sure what style is right for you? Contact Go! Vermont’s resident Cargo bike guru, Dave Cohen, with any and all bike-related questions. Contact Local Motion or the Vermont Bicycle and Pedestrian Coalition. 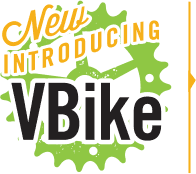 VBike is a nonprofit organization providing leading-edge bike solutions in Vermont. A convenient and affordable bikeshare system that connects people to more places where they live, work and play within Chittenden County.